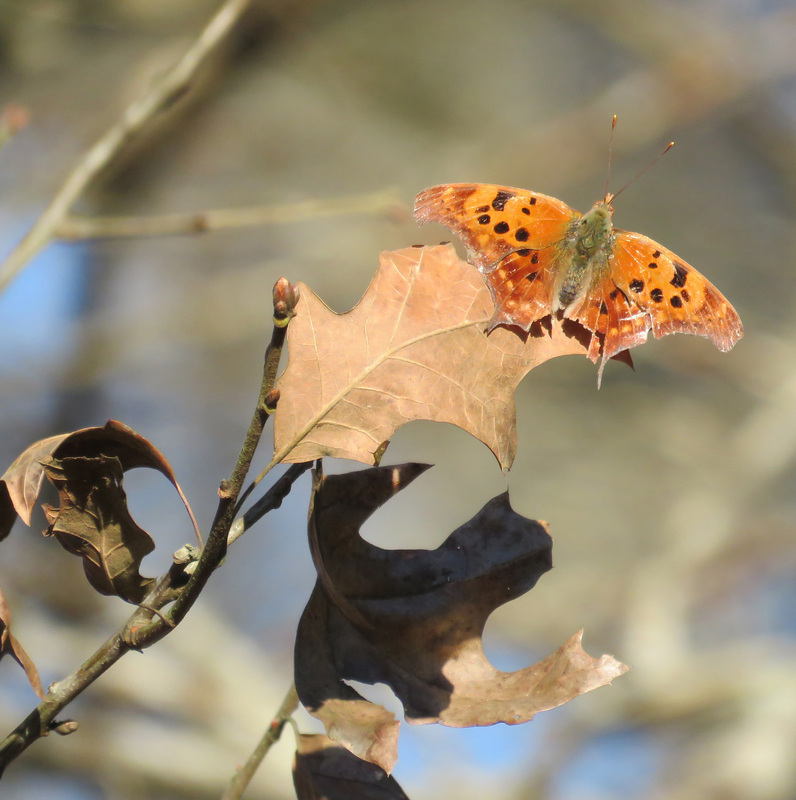 Spring is here and the woods are full of butterflies. In case you couldn’t find it in the previous photograph. Look for the mark in the red circle. I haven’t seen Question Marks often here (except one time when there was quite a group settled onto the compost heap, and I didn’t take any pictures, because I thought that would happen all the time, but it didn’t). But right now I am seeing a lot of them, chasing each other round and round the tree trunks. Bringing beauty to last year’s leaves. When I looked at this picture on the computer, I was wondering why a butterfly so newly hatched (so I thought) would look so battered. 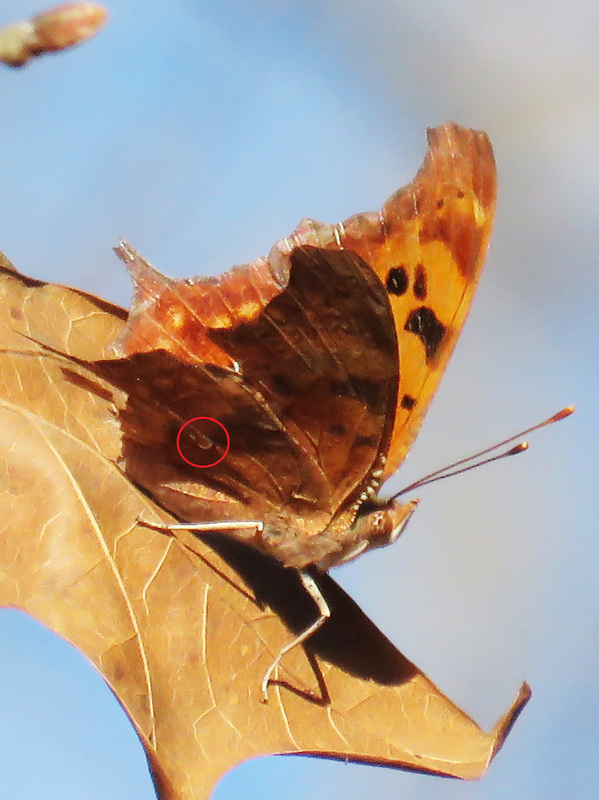 Polygonia interrogationis. 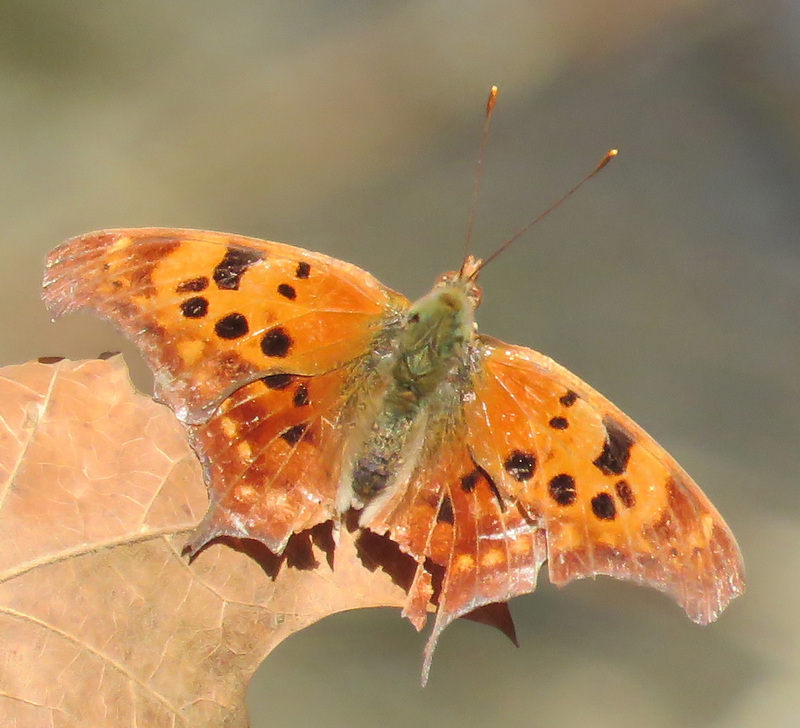 Perhaps this one should be called Polygonia interruptus, because some pieces are missing. It turns out that there are two broods of this species each year, one in summer and one in winter, and they have different wing patterns. The summer form has large areas of black on its lower wings. 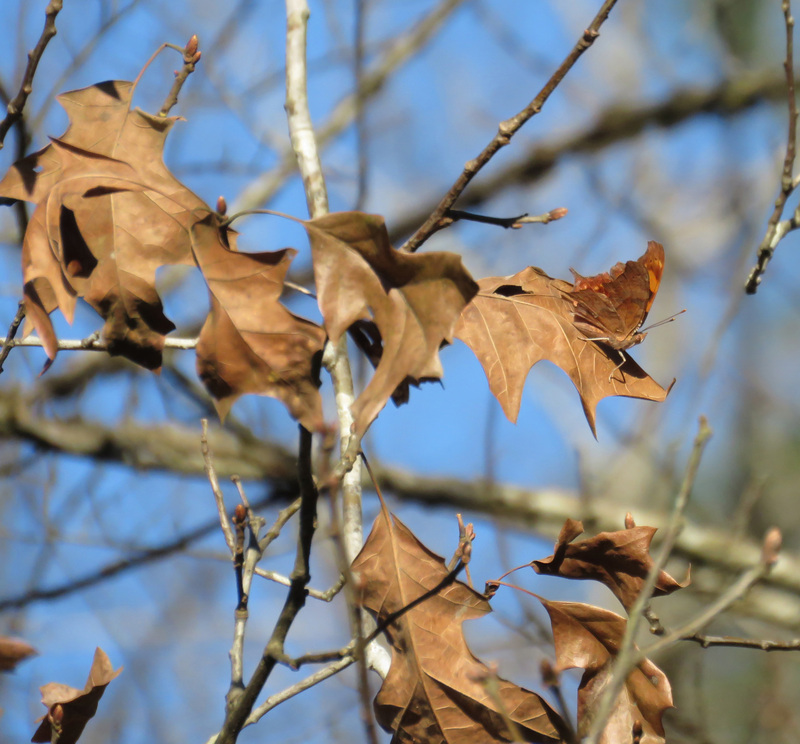 So the ones I am seeing now, with lighter wings, are the winter brood, which emerges in fall and lives through winter. “Winter adults hibernate during the coldest weather, seeking shelter in tree cavities, beneath loose bark, or even under old boards. They emerge on warm, sunny days, basking with spread wings on tree trunks and other exposed perches.” (John and Gloria Tveten, Butterflies of Houston and Southeast Texas, p. 144.) So this particular butterfly apparently hatched months ago. Like Commas, Question Marks are part of the Anglewing genus. 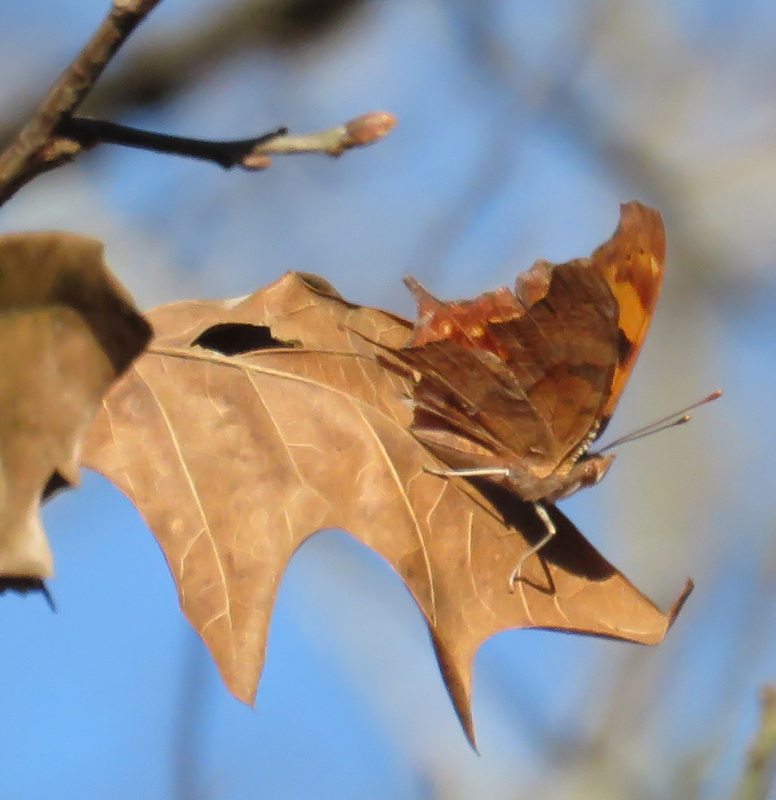 Their host plants are supposed to be elms and hackberries, but the butterflies I am seeing are all over the oak trees, and looking at these pictures, you can see how the odd bends and angles of their wings give them perfect camouflage on those old oak leaves. Elms and hackberries have small leaves, about an inch long, with serrated edges, and this time of year, they don’t have any leaves on them at all. The Tvetens say, “The male is aggressively territorial, perching on a tree limb or flying out to challenge any intruder. He seeks a mate during the late afternoon hours.” I am seeing that behavior of perching and then chasing off intruders. So my question is, if their host plants are elms, why are they defending oaks? And from whom? There are way more old oak leaves than there are Question Marks, it seems to me. Just another example of how the smallest creature turns out to be so interesting. I would have never even thought that butterflies would fly in a certain direction with purpose, much less intend to chase someone else off!